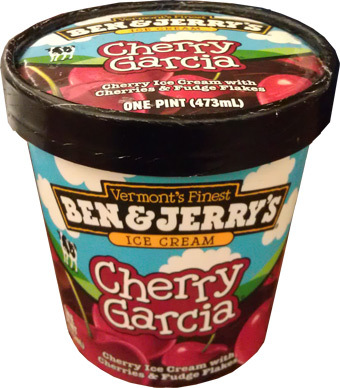 One of the very first reviews on this blogs was for Cherry Garcia. Not only is it Ben & Jerry's top selling flavor (for some unknown reason), but it's my wife's favorite flavor as well. This one obviously holds a special place in a lot of peoples' hearts, so let's take a closer look at it. Dude, those aren't flakes, those are chocolate bricks. I think people love the plentitude of the bricks, look at all of them. 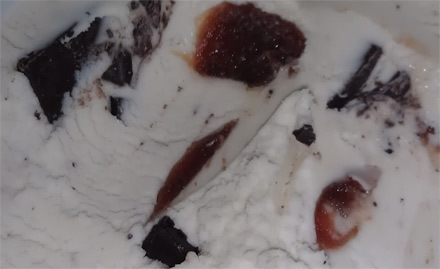 Me, I'd love to see Cherry Garcia Jr made with super thin flakes that crunch instead of thud. I wanted to throw up a close up of the big cherries. I wish they were softer like the ones in my amaretto cherry gelato review. Now that I'm more mature and more sophisticated, do I love this one now? Honestly, I still don't get it. I mean, it's really well made and there's no artificial flavors hanging about. Quality is not the issue here. I just don't dig giant chocolate chunks with my cherry flavor. I want to enjoy one or the other, not both. The super creamy cherry gelato flavor the other day was just fun. Here, I really do get frustrated by the chunks and I don't really appreciate the cherry skins either. I just want cherry flavored ice cream, that's all. You can call me crazy but this one still doesn't work for me. It's not like I choked it down or anything, perish the thought, but I just wouldn't pick this up on purpose for myself. If they ever want to switch it up and add say graham cracker crust swirl with sugar crumble topping chunks, give me a call because I'll be first in line to try it. Too bad that it has water as a main ingredient, along with liquid sugar(sugar,water). For a super premium ice cream, a disappointment. are you the same person that just dissed my skinny cow opinion? just curious. High! U complain way toooooooo much. Gosh. Softer cherries. Smaller pieces of chocolate. U want someone to pop out of it and feed u too? SMH. @Dweller: first, your other comment was unnecessary and has been deleted. I prefer a thoughtful debate, not insults. second, I highly suggest you find yourself a freezer aisle and try some other cherry flavors. Sure big chunks are neat, a lot of people dig them, but I prefer a smaller and more balanced approach. This does not make me a sissy, it simply means I have an opinion. Its not about spam, its about you wanting to be in control. you got a lot of anger leotie, and yes, i just deleted 1 of your 3 comments for using foul language, just as I had with Dweller. This is a family friendly blog that has always used comment moderation. 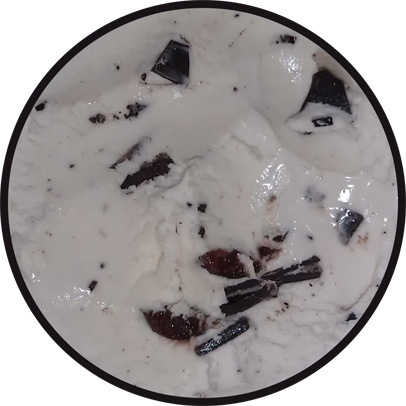 This is ice cream we're talking about, why in the world would you resort to calling me names to defend it? Hate filled comments have no place here.